Author Danny Parker (kneeling) talks with three students from Palmyra PS - Leah Hodnett, Benji Cicerello and Pippa Nichols, joined by The Sound of Picture Books cast. IMAGINATION can bring a book to life, but so can good music, as the West Australian Symphony Orchestra proved during a special program at The Literature Centre last week. 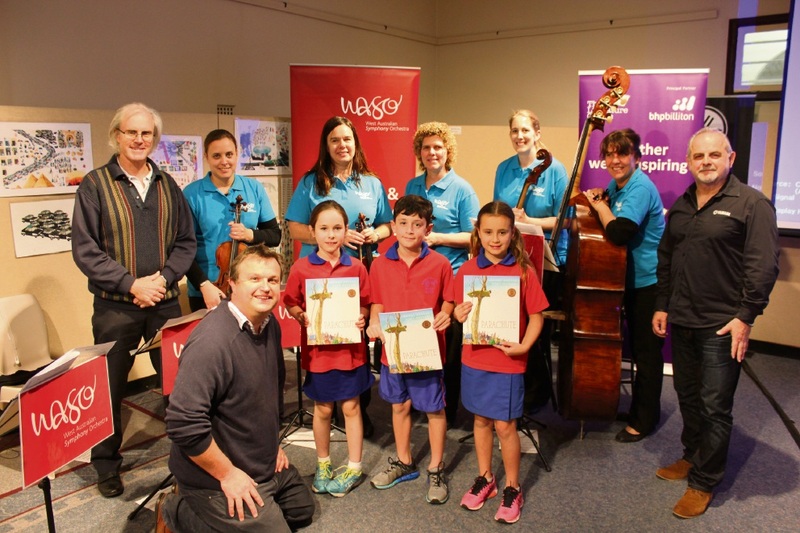 With the help of author Daniel Parker and illustrator Matt Ottley, the WASO musicians provided a captivating backing track to the live narration of two books, Parachute and Home and Away. More than 1700 students from across WA, including Palmyra and Bibra Lake primary schools, enjoyed the special four-day The Sound of Picture Books program. The Literature Centre director Lesley Reece said The Sound of Picture Books was a unique way for children to learn and interact. “During these sessions I’ve adored seeing students of all year levels either participate in Danny’s drama, pretend to conduct the musicians or laugh at Matt’s fun scribble drawings that he turns into music before their eyes,” she said. Visit www.thelitcentre.org.au for more information.